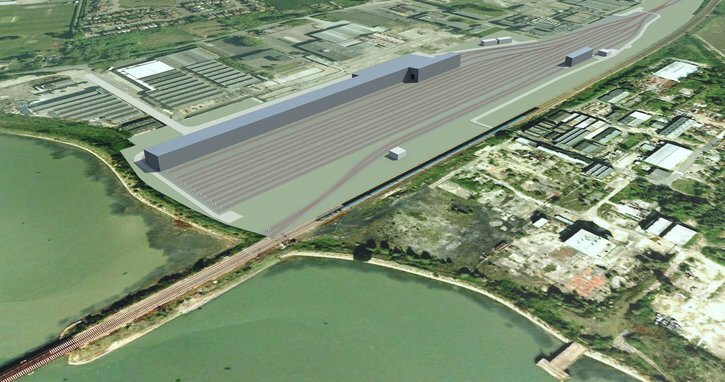 Taylor Woodrow has been appointed to design and build a brand new state-of-the-art depot which is integral to Greater Anglia’s commitment to transforming the railway in East Anglia. Covering an area of 22 acres on the north side of the existing railway, the depot will be used for stabling and light maintenance of around 20 new trains at Brantham near Manningtree. It will include 13 tracks where trains can be parked overnight for cleaning and toilet maintenance. Two tracks will be undercover in a 300-metre shed, with full under-train inspection pits and cranes for general train maintenance. There will also be a latest technology wheel lathe, so that wheel repairs can be carried out on the network, minimising the length of time trains are out of service. Other facilities will include a train wash, remote train monitoring systems, a control room and spares storage. Design work and construction planning for the multi-million-pound depot starts this month, and the site is due to be cleared in March with construction scheduled to start in the summer and be completed by December 2018.